Carbon pricing already raises over $20 billion p.a. worldwide. This has the potential to grow by an order of magnitude. What to do with this money will be an increasing important issue. The number of allowances allocated free of charge (under an emissions trading scheme) or the extent of tax exemptions and rebates (under a carbon tax). About three quarters of the revenue raised is in Europe. Interestingly, revenues from auctioning of allowances under the EUETS are lower than those from other carbon pricing in Europe, which includes carbon price support in the UK and carbon taxes in France and Scandinavia. This is in part because EUETS revenues have been reduced this year by the postponement of some allowance auctioning (backloading). 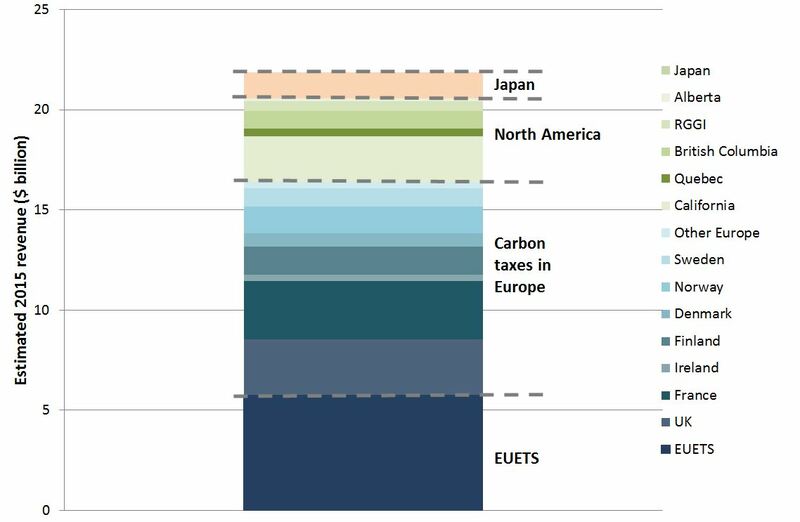 The remainder of revenues raised worldwide are from the various North American schemes and the (rather low) carbon tax in Japan. There is no auctioning of allowances under the New Zealand or South Korean schemes, or in China, so they don’t yet contribute to the total. Notes: Estimates based on prevailing prices multiplied by volumes covered, excluding freely allocated allowances and tax exemptions and rebates. Data is estimated from a variety of sources and totals may be lower or higher or than shown as assumptions have been adopted for coverage and rebates where data is not readily available. Small variations in coverage can affect estimates significantly in individual jurisdictions because of high prices.The Mexican carbon tax is excluded as it does not price emissions from natural gas so more resembles an energy tax on some fuels. Other Europe includes Portugal, Switzerland and Iceland. the coverage of the California and Quebec schemes, which expanded to cover transport and other sectors in January this year. prices rise under the major schemes, including the EUETS. Indeed, over time revenue raised globally could increase by an order of magnitude or from current levels to reach into the hundreds of billions in the longer term. However even if revenue grows to approximately ten times current levels over the next decade or more it would still represent only perhaps 0.2% of global GDP, and so remain only a small proportion of total flows within the world economy. This is nevertheless a substantial amount of money, and there is likely to be increasing debate about how it might best be used. I will return to this in my next post. This entry was posted in carbon pricing, carbon taxes, Climate change policy, emissions trading, Revenue and tagged carbon pricing, carbon taxes, climate change, climate change policy, decarbonisation, emissions trading, emissions trading scheme, revenue on 27/10/2015 by adamwhitmore.